French institutions have performed particularly well in the second annual internationalisation rankings from user-driven global higher education U-Multirank rankings, while all 27 of 237 institutions analysed which achieved the top scores available are in Europe. “Achieving four ‘A’ scores for international orientation is a significant achievement. Not many institutions are ever likely to accomplish it." This is the first year U-Multirank has published a ‘ready-made’ table comparing how institutions perform in the area of internationalisation. The top-achieving 27 institutions achieved an ‘A’ grade in each of the four metrics: incoming and outgoing student mobility; proportion of international staff; international joint publications; and international doctorate degrees. The list is a unique cross-section of universities, business schools and other types of education institution. France leads the rankings, with six institutions attaining top marks across the board, followed by Austria, with four, while Belgium and the Netherlands each had three. Among the top-ranked institutions are EPF de Lausanne, HEC Paris, Dublin City University in Ireland, University of Innsbruck in Austria and Technical University Denmark. The ranking considered 237 universities deemed to be active in the area of internationalisation, with 7.5% or more of their student body being foreign degree seeking students. Of these, 187 are in the EU or EEA. Gero Federkeil, U-Multirank project coordinator, told The PIE News that it was encouraging to see such a range of institutions had achieved the top results. “It was interesting to see that it was not just universities focusing on research that achieved highly, but there was a range of institutions – specialist colleges and business schools, for example,” he commented. HEC Paris performed especially well, scoring in the top 10 on three of the four assessed indicators; while the University of St. Gallen and Central European University Budapest both appeared in the top 10 achieving universities in two categories. Institutions are assessed at both institutional and then field level for four subjects: mechanical and electrical engineering, physics and business studies. At the field level, institutions were assessed based on four criteria: international orientation of Masters programmes; international research grants; international joint publications; and international doctorate degrees. EPF de Lausanne and ETH Zurich both achieved an ‘A’ grade across all four categories in both the mechanical engineering and electrical engineering fields, while Ecole Centrale de Nantes also achieved top marks across the board in mechanical engineering. 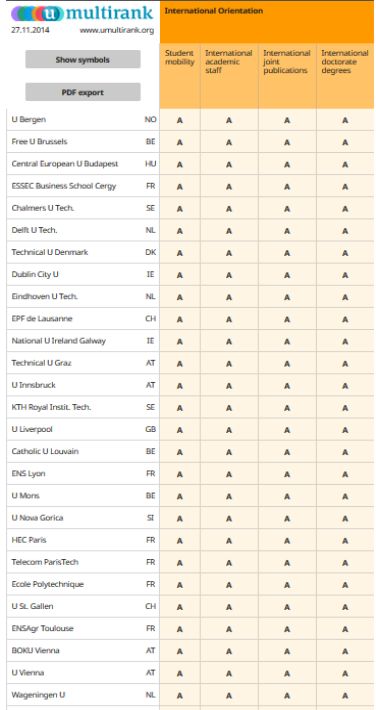 Free University Brussels and Tilburg University both achieved four ‘A’s for international orientation for business studies, while none did in the physics field. A second edition of the rankings covering five dimensions of university performance is due for release at the end of March 2015, covering a broader range of subjects than last year’s publication, adding psychology, computer science and medicine. U-Multirank was launched last year, and is based on a combination of information supplied by institutions; data from international bibliometric and patent databases; and surveys of more than 60,000 students at participating universities. Initially the ranking was backed by €2m in EU funding, and Federkeil confirmed that the ranking’s organisers are “looking into” more sustainable funding models for the future. However, he said that it was “not planning to go down the commercial route” taken by other rankings companies QS and THE of charging universities for data or consultation services.